Which rather begs the question: If there was a conundrum then the skeptics who pointed it out were not deniers, but correct. And if there was no conundrum, and deniers were denying something, then this is not a new finding at all. Alternately perhaps some researchers “knew” the answer they were going to find, and the other researchers, who can’t see the future, are deniers? Is Nature reporting a discovery, or issuing a political press release? The use of “denier” in a science paper has a price. How, I wonder, does Nature define homo sapiens climate denier? — Bipedal primates who deny the sky? Researchers now throw global warming under the bus? Look out for the death of the “global warming” term, and the rise of regional warming scares. Reality bites again. The miracle of deep ocean currents? Perhaps the paper has some teeth to it, but it’s not obvious in the press release. They appear to be announcing discoveries from text books. It’s been known for years that the deepest oceans take about 1000 years to turn over. So it is entirely expected that the water around Antarctica is old and cold. The circumpolar current and deep ocean circulation has been known for years (as in this old popular map). Really – that was the old idea? The Southern Ocean’s water comes from such great depths, and from sources that are so distant, that it will take centuries before the water reaching the surface has experienced modern global warming. Follow the implications — this is going to keep going. Antarctica will be fine for centuries? There’s no rapid sea level rise coming and no imminent destruction of the shelf? Forget all the images of penguins dying from global warming which is regional not-warming in Antarctica. So were all the papers blaming “global warming” for Antarctic icebergs, starving penguins, and collapsing ice shelves all wrong in attributing them to man-made warming which won’t arrive there for centuries? Could be. Observations and climate models show that the unique currents around Antarctica continually pull deep, centuries-old water up to the surface — seawater that last touched Earth’s atmosphere before the machine age, and has never experienced fossil fuel-related climate change. The paper is published May 30 in Nature Geoscience. Ocean circulation is fairly textbook stuff, hardly a new discovery. The image below is from a post in 2010 where William Kininmonth explained the importance of our ocean circulation. Surface water pushes north. And we’re back to “modeled discoveries”. Call it simulated science? Someone put dye into a climate model? That’s got to be bad. Seems the real deniers were the ones who denied the Antarctic Pause, and the failure of the climate models. All the modelers said CO2 would amplify the warming at both poles. The models were wrong. Excellent – something to show my credulous relatives. I have noticed on a few occasions that the water dripping from Tasmanian oysters was past it’s “use by” date. I thought to myself at the time, “Gee, that water must have been there a long time”. Yep! It’s that “old water”. It’ll confuse you every time. So Roy you are still locked in the backward looking, LNP stooge mode of thinking that only focuses on the “old water” huh? You really should be looking at promoting the clean new water of the future. The clean new water of the future is where we should all be focussing our attention. Is that concentrated water or dilute water? It is dehydrated water. That is the only type of water which is able to give us the predicted drought/flood. Whatever happened to heavy water? What did you expect. They blamed the Old Water. Who would have thunk it? I am Googling “regional warming scares as we speak”. Yew bewdy! Don’t know how double post happened, sorry! An increase in red hot chilli crop yields is an example that shows that carbon dioxide causes heat. But I can’t think of any other examples where it does. Hey…..talking about cold and chilly, May was quite a chilly one as months go wasn’t it!…..I wonder if the climatecrats will try saying it was the hottest May ever? Guess we’ll see shortly. Well Robert, that’s just the thing we are looking at on this thread, variability. No doubt you had a cold May, but here in Newcastle it was unseasonably Warm. What we need is an average! Robert what you say applies to Perth – the coolest April/May maximum temps on record at the BOM Perth Metro Mt Lawley site (1993 – present). Perth has experienced “winter-type” weather in the last month of Autumn. May – 1.4 degrees below average and a lot wetter with 112mm. April – 0.9 degrees below average and a lot wetter with 68mm. Don’t mention AGW in Perth – no one believes it anymore except the delusional “Warmists” and they will be totally distraught when the GM/LIA kicks next decade. Remember that verse from “American Pie” – “the day the music died” well maybe Ross Mclean can pen another hit song next decade entitled “Cold American Pie” – “the day the Theory of AGW died”. Got me Alan – a faux pas by yours truly – I actually know a Ross Mclean (similar age to Don) and he will be honoured to write that song next decade although it won’t reach the dizzy heights of Don’s 1971 classic but like that great song, it will deliver a very impt message including – ” but the levee was dry but not from AGW and ……”. The song, like the GM/LIA, will be cool comfort to the distraught “Warmists”. The last few days of May were pretty cold here and now it is the Freezing First of June. I’ve been covering the lime (as in citrus) and other tender plants at night for a while now. Last year we lost every lime thanks to frost and to the reducing enjoyment of our G and T.
Well, I spend quite a bit of time retreating to a place on a coastal lake by the South Coral Sea where I am at the moment. At night over the last two weeks had to put on a second and third blanket, rug up, and close the bedroom deck doors! lol. Turning to another issue that is affected by the weather. The birds on this lake, hundreds of cormorants, pelicans and black swans are badly affected by the pesticides and herbicides (weed killers) the local government swamps the surrounds with incessantly. If you drive around the adjacent main roads you see a permanent and continuous dead foliage strip along each side of the road and under the fences for kilometers on end and many fluoros spraying the stuff around indiscriminately. In the colder and wetter weather the fish that the cormorants eat disappear and it was explained to me by wildlife vets that these birds start living off their fat tissue, which is where their system stores all these pesticide etc poisons that inevitably get into the fish that they eat all the time. We literally have to rescue ‘drunk’ cormorants even walking down the middle of the highways sometimes. So it was very interesting to read an article in the Australian today headed “Pesticides blamed for crash in bee populations.” In the journal “Nature Publications” a published scientist has found that pesticides are to blame for a dramatic crash of bee populations over the past decade. Apparently Albert Einstein said once that he predicted that mankind would not survive half a decade beyond the extinction of bees (unless mankind figured out how to pollinate food crops in a world with little or no bees). When are the bureaucrats going to stop waisting their time on non issues like co2 and climate change and start being concerned about the real issues like this that we all face. Whenever I see the endless strips of sprayed dead weeds in public areas I also wonder just how much this has to do with the increase in cancer incidence, not to mention the effect on all the animals. I see no concern for these issues whatsoever coming from the left socialist, meant to be compassionate, side of politics. R. ..sorry, unnoticed predictive text got away from me. Ah yes, but the Greens are “saving the planet”! And they’re too busy to actually do the job that they originally set themselves! Most of May was quite warm in Sydney – well above average temperatures, but as soon as the climate alarmists started talking about an expected warm dry winter (great for golf), temperatures plummeted and along came the rain. UAH for Australia become available in a few days. Tell me Gee … do you know what a transient is? apart from the definition of your park bench address ? So.. absolutely NOTHING to do with CO2.. agreed? do you understand enough to realise that ? Humm?, how old is the warm water being released from the current declining El Nino? It is good to see “Nature” has discovered ocean currents. The first few hundred meters of the ocean contain hundreds of times more energy then the entire atmosphere. Input to this region has immense variation from solar spectrum changes over solar cycles , which, as far as I know have never been quantified as the residence time of disparate solar insolation into our oceans is not known or studied. Has anyone actually read the paper? Did the quantify historical changes in the T of the ocean currents which eventually upwell in the southern ocean around Antarctica? Did they find quantifiable increases in aspects of these ocean currents which will make any measurable difference EVER in the upwelling southern ocean zones? Or is it turtle models all the way down to the “wart on the frog on the bump on the log in the hole in the bottom of the sea”? Ahh, the word is warmth is making the crops more toxic – not just hotter! Funny – when we had extreme heat spells ’round my area the veggies seemed fine – bigger, maybe, but not toxic. You can see why these people are paid the money. What is this “we” nonsense? If that were the case you (we?) would not need to find the average temperature. We could use the temperature anywhere to show warming. It does shed some light on the associated cognitive dissonance of claiming warming now if the average has increased but disavowing warming in the past if it did not happen everywhere at once. Yep, if the average, regional, etc. data show no warming, now the Alarmists can use a small area or even a single point to scream Local Global Warming! As each global warming hypothesis and fact gets debunked by reality, the Alarmists always have a fallback definition or claim to continue slurping $ from the taxpayer and living the high life. The Green Blob lives! If it’s local it ain’t global, eh? Don’t forget, these are the same people who gave us Global Average Temperature – as if the average value of lottery balls was meaningful! I like concise and penetrating comments like this. Get it to the U.N.
Have a nice day, we live in a times of ideal natural climate. Next they may even find that the upwelling of old, cold water is not constant in it’s flow rate, temperature or CO2 content. Oh bother, there goes the models again. You would think it a prerequisite of climate science/oceanography to conceptualize things in three dimensions plus time. It was intentional that we saw the global average as happening globally. It made it easier to ignore that a fraction of a degree change in the average of samples, that need adjusting, were not evenly spread around the globe and supposedly showed that everyone could see the effects here and now, had to be taken with a pinch of salt. There is a little problem with all this instant hocus pocus science. How does the universally predicted warming get from the air to the ocean without actually warming the air? So we have gone from +5C in 100 years to the oceans stole my warming? Even Prof Turkey had a waffly science sounding explanation about adiabatic winds for being trapped in ice which was not supposed to be there, even though he had seen it in photographs. What sort of scientist takes 30 years to discover the oceans have a great effect on air temperatures, being just as thick and a mere 340 times more massive than the thin atmosphere and containing 50x as much free CO2. Next they will be saying that warming ocean surfaces actually releases more CO2 and we have come full circle. The concept of equilibrium which underpins all science is amazingly absent in these snap conclusions, each more right than the previous. The most important rule when you promote a new insight into why you were right all along is to never admit to being wrong in the first place. Even in the ‘debate’ Malcolm Turnbull talked about ‘The Science’ as if it was Holy Writ, scripture, a complete system of beliefs and traditions not to be questioned. I prefer real PM Tony Abbott’s accurate description, crap. The really big problem, as Jo implies, is that if your heat is ‘stolen’ somehow by something 340x as massive (average depth of 3.4km), the increase in temperature is 1/340th or 5/340 or 0.014C. So there is no problem and the fish would not notice. You then have a real problem and massive inconsistency in explaining how the temperature suddenly went up 0.5C in ten years and stayed there. Surely that should be stolen too? You really have to think people make this stuff up and then publish with a few old charts. What happened to real science? When does any old explanation do? Little problem? More like major problem. The only way the ocean is actually heated is solar radiation (and a very small amount of geothermal from below). Sure climythologists claim its cooling rate can be slowed by incident LWIR from the atmosphere, but they are packed so full of it, it is spewing out of they lying mouths. Climastrologists actually have no plausible mechanising as to why CO2 causes ocean warming. Build the experiment and check. I did. I know you did less. (ever considered doing more?). Fill both target containers below strong and weak LWIR sources with 40C water and monitor cooling rate. Whoops! No difference in cooling rate. Seems surface incident LWIR cannot heat nor slow the cooling rate of water free to evaporatively cool via a ratiatively cooled atmosphere. The only thing CO2 does is cause immeasurably slight cooling. But “immeasurably” is the catch. There is a world of difference between Konrad saying slight cooling and David Evans saying slight warming. That would be the divide between science and politics. David picked the wrong side. The Internet remembers, forever. The Sun emits short-wave radiation. The Earth reflects some back into space without absorbing it, currently fluctuating a little above and below about 30% of about 1360 Watts per square meter that falls on the disc that faces the Sun. Since the surface of the Earth is about four time the area of the disc, downward solar irradiance is about 70% X 1360 /4 = 240 Watts per square meter. The Earth is too cool to radiate in the short wave part of the spectrum. The Earth can REFLECT short wave energy, but re-radiates (emits) only in the long wave part of the spectrum. See: Google Books, Goody and Yung, page 4. So about 30% of solar energy is is reflected back to space by land and plants and ice and snow and clouds and aerosol particles in the atmosphere. This reflected energy is excluded from the energy balance calculations. All solar energy that is not reflected back to space (about 70%) is absorbed by and heats the air and aerosols, ice and snow, land, oceans, plants and animals, about 240 Watts per square meter on average. Some of this energy s ultraviolet, but most is visible light to which the atmosphere is mostly transparent. The oceans are partly transparent, and depth of penetration varies. The solar energy that penetrates the water is mostly short wave energy, mostly visible light, less tha 0.7 micro-meter. The albedo (reflectivity) of the oceans is typically only about 6%, so 94% of visible light falling on the ocean surface penetrates and is absorbed. Most solar energy falls in tropical latitudes and between 23.5 degrees north and south, where the oceans occupy about 70% of the surface. So it’s obvious that most solar energy that reaches the bottom of the atmosphere enters the oceans and does so as visible light. That energy exits the oceans as thermal energy, mostly as the latent energy of evaporation. This leaves hanging the question of balance between incoming and outgoing radiation. Incoming and outgoing must balance, or at least must adjust in the direction of balance (equilibrium). The wavelength at which the Earth radiates and the amount of energy the Earth radiates depends on its temperature. So if, for some reason more or less energy enters or leaves, the Earth’s temperature will increase or decrease. At this higher or lower temperature, the Earth will emit more or less energy until a new balance is found, if ever. If ever, because the Earth’s climate system can reach an instantaneous balance, but never reach a stable balance. To appreciate how much energy imbalance is revealed by the data, we can look at the figure reported James Hansen and others in 2011, estimated from ocean heat content (OHC). “The inferred planetary energy imbalance, 0.58 ± 0.15 W m-2 during the 6-yr period 2005-2010, confirms the dominant role of the human-made greenhouse effect in driving global climate change. Note the precision of the estimate. Both the downward and upward radiation have measurement errors. So we have to add about 239 + 239.58 to get the total basis. This is a precision of 1.2 parts per 1000 for six years for the entire globe. What did Dr Hansen’s colleagues think of that? First they rounded 0.58 to 0.6 W m-2. And then they said that such precision is not possible with existing technology. “The net energy balance is the sum of individual fluxes. The current uncertainty in this net surface energy balance is large, and amounts to approximately 17 Wm-2. This uncertainty is an order of magnitude larger than the changes to the net surface fluxes associated with increasing greenhouse gases in the atmosphere (Fig. 2b). The uncertainty is also approximately an order of magnitude larger than the current estimates of the net surface energy imbalance of 0.6 ±0.4 Wm-2 inferred from the rise in OHC. The uncertainty in the TOA net energy fluxes, although smaller, is also much larger than the imbalance inferred from OHC. (TOA means top of the atmosphere). His colleagues said that the uncertainty in the net radiative balance is 17 Watts per square meter. More meaningful error bars would be +0.58 +/-8.5 Watts per square meter. This implies that the uncertainty in radiative balance is not merely the quantum, but also the sign of the imbalance. Dr Hansen’s data cannot tell us whether Earth was warming or coolong. Now it may seem I am being unduly harsh with Dr Hansen, but I have followed his career as a scientist and as a political activist and I am convinced that he is a true believer in the “Coming Catastrophe” and I wish that he had not spent so many years of his life distressed by this illusion. Sure. However the proposition was that the air would get warmer, imbalances notwithstanding. That is what all the models predicted and they are all wrong. The planetary temperature as measured by satellites at distance has not changed in 20 years. That has to be far better than land based thermometers. Also as noted in the article, heat absorption by the oceans and an imbalance hardly matter when you consider the incredible mass of the mobile oceans, something only now being considered. It is the major recipient of all heat as you point out but has been left out of the equation for a long time and is only now being belatedly considered as a backhanded way of explaining abject failure in every prediction. My particular continuing concern with Hansen’s “human-made greenhouse effect” is that while CO2 has gone up 50%, this is alleged without proof of any sort to be a largely man made increase. No evidence has been given except rough coincidence. Even then the reverse conclusion is more likely. Heating the oceans would expect to release the 98% of free CO2 in solution in the oceans by simple Henry’s law in Physical Chemistry. Hot lemonade. However nothing is said. This man made CO2 allegation can be proven or disproven and without man made CO2, the whole logic collapses. You can easily measure the amount of Man made CO2 in the air by radio carbon dating the CO2 and it is well under 5%, closer to 2% in 1956. Fossil fuel has no C14, unlike modern CO2. If the 50% increase was man made the C14 would be down 33%. As for whether the greenhouse effect actually works with CO2, CO2 is a tiny trace gas and it is generally agreed that CO2 alone cannot produce a noticeable warming without amplification from secondary evaporation of H2O a real green house gas. This is an effect which is known not to exist because there is no hot spot over the equator. So there is no CO2 warming and while CO2 continues to rise, the temperature is not changing, another absolute proof. So whatever Dr Hansen is on about, there is no logic to this human made greenhouse effect. Water is and remains our major greenhouse gas, if only because clouds are largely opaque at many frequences, unlike nearly transparent and tiny CO2. In absolute terms CO2 is inconsequential and even if it was important, we do not control CO2 levels. The sun does. Inferring a world disaster from a slight alleged imbalance and an unproven argument about man made CO2 makes you wonder why such an unlikely, unproven and even very silly hypothesis has resulted in all those windmills. They are still being built. The windmill industry is not sustainable. I also have concerns about these amazing calculations averaged over all latitudes, seasons, night and day, temperatures and cloud conditions. There are time delays too. Also something which is in balance on average at a given time may not be in balance at all times. This is all about fossil fuel and Western democracies and the UN. In all the reading I have done, I have yet to see any proof of man made global warming. It is all hand waving and yelling without facts. As for man made Climate Change, it is impossible to follow how you get CO2 driven Climate Change if you cannot get a change in temperature. This is just busted, a fantasy. Pray-tel how one can easily see city lights reflected from a nearby body of water (lake, river)? Your claim of 94% absorptivity of any natural surface is as bogus as every other part of your pre-canned Climate Clown nonsense!! Not one word of what the academic meteorologists, (climatastrophists) CLAIM has any scientific meaning whatsoever! You see it at an angle at night? Pray tell, what have city lights at night got to do with sunlight got to do with sunlight that penetrates the ocean surface? In my opinion, your habit of using abusive language like this here and in many of your other comments makes me wonder if you are still in high school. If so, I wonder if you will ever pass your science courses. do have a care. Will is indeed old, grumpy and abusive. But what would you expect from someone old enough to write the core of MODTRAN code so carelessly abused by climastrologists while living through the AGW hoax? It’s not just SW reflectivity that is the issue. It is LWIR emissivity. Water is weird. My early experiments showed water having a high LWIR reflectivity, low LWIR emissivity at lower angles of incidence. Climythologists claim over 0.9 emissivity for water covering 71% of our planet. Wrong. Hemispherical emissivity for water in LWIR is below 0.7. Will found this out via empirical experiment before I was born. If you want to challenge Will, show your empirical experiments. “But you’re rude” is not a scientific argument. Will is rude. He’s also right. I checked. Did either you or Will read what did I said about energy emission from water? As for empirical evidence, I cited my experiments with LW bands of multispectral satellite images. The polite way in which I expressed my disagreement with anorthodox climatologist differs from the crude way Will expresses himself is because I still remember what my parents taught me about good manners. I like to think Will suffers from “Finger Tourette’s Syndrome”. It’s brought about because of all the typing necessary to really explain over and over again what is wrong with “Climate Science”. I took it badly for quite awhile then I started to read between the outbursts. There is value there and you don’t need to take it personally. He knows things and he has a pretty keen sense of humor. First of all thank you for posting here on this blog. He has previously been given some stick ( http://joannenova.com.au/2015/10/new-science-16-building-the-alternative-model-and-why-it-solves-so-many-major-problems/#comment-1760017 ) about his often unintelligible writing, but deep down there is something, something that may indicate a good understanding of the reality of radiation in our atmosphere, and therefore the cooling of it. Of course this does not excuse the behaviour, but Nobody is perfect esp me and so how likely is it that we will see change? So much of the “scientific” writing about climate change is written by people whose academic qualifications are short on real science and long on “Environmental “Science”. One of my own pet peeves is the poor use of models (http://joannenova.com.au/2015/10/new-science-16-building-the-alternative-model-and-why-it-solves-so-many-major-problems/#comment-1760326) and the failure to isolate ALL relevant sources and sinks and stick to the issue: Human Origin CO2. As far as Will’s comment about your post above I would have felt you were entitled to say that he had a slanted view of the material and ask why was he trying to make an issue out of the “reflected ” energy from a few 50 watt light bulbs; is a few hundred Watts spread over a view window of say 1000 sq metres really such a big issue. My own wish is that Will would not be so cryptic and try to do one single post where he condenses his idea of how energy moves towards our Earths surface and then away from it. He may do a good job of it , who knows. Finally, that killer of all mankind, man made global warming science is settled some more, uh again, I mean still. Thank goodness that the threat Al Gore warned us about is over. No more CAGW. Thank you for a clear, logical dissection that again shows some dangers of detouring around text books of the recent past. Jo and Geoff: excellent points about re-examination of the old text books. They are full of information that refutes the pseudo scientific crap that has been churned out by the Warmists these last two decades and a half. Back about 12-15 years ago practically every television news bulletin carried yet another story of a major mass of ice calving off the Antarctic ice shelf and using it as an example of “this (gasp!) dangerous global warming that we are now undergoing!” Remember all that? Guess what? It’s just a normal process in a part of the world that remains very cold. How about that!!!! Other breakthrough scientific news: Rocks are hard, fire is hot, and water is wet. Do you have any scientific proof?? That depends on your definition of hard, hot and wet. Reality is not dependent upon your definitions. Your definitions must be dependent upon reality or they are without a referent and thus have no meaning. There is a quality known as hardness and rocks exhibit that quality by not deforming with light to medium pressure. The reference hardness is YOU. You can be deformed using light pressure. Thus you are not hard. Hot is a relative measure of temperature and is dependent upon your reference temperature. The reference temperature is YOU. Your temperature is approximately 98 degrees F. The temperature of fire, with only one exception I know of, is above the burning temperature of wood. Thus compared to YOU, fire is HOT. Wet is a quality of a liquid that adheres to a hard surface. Most usual hard surfaces can become wet because water adheres to it. Various man made materials cannot be made wet with water. However, since YOU are the reference, water can adhere to you. For example, stand outside in the rain. You WILL become wet unless you are covered with a material to which water will not adhere. Simply defining hard as soft, wet as dry, and hot as cold does not change the nature of rocks, water, and fire. If words are to have any meaning, they MUST refer to something that exists in reality. The fact you think, feel, imagine, and fantasize differently is irrelevant to the things that exist. The problem of our age is that reality is held to be irrelevant and optional. Only feelings, opinions, and beliefs are held to be “real” and therefor define “reality”. The reason this leads to failure, death, and destruction is that reality doesn’t pay attention to your feelings, opinions, and beliefs. It is what is, it is only what it is, and it is your responsibility to be coherent with reality or you will fail, suffer, and die. You have no choice in the matter. Bottom line: Proof implies the existence and validity of reality. Thus, proof means showing the coherence between the statement subject to proof and the contents of reality with feelings, opinions, and beliefs excluded from the process. Lionell, you’re thinking like a denier, this is the new-world-science here today. Hot is how it feels to you, wet is how depressed you feel, and hard is not allowed in schools anymore. Nice bit of Reality there Lionell. If words are to have any meaning, they MUST refer to something that exists in reality. Words with a physically defined referent are a subset of the set of meaningful words. You may intend or feel those kinds of words have meaning but that so called meaning is at most an intent – a fantasy. You and others may even agree what they look like and how they behave yet there can be no offering of physical evidence for such creatures. You have only your words and the words of your fellow believers as evidence. Even a 97% consensus of the population of the earth, that your descriptions are correct does not make the object of your intent exist nor your beliefs and fantasies, true. Such words are parts of a totally subjective word salad with no validatible and verifiable content. In other words: meaningless – absent of cognitive content. Sorry. Lionel, those words do have cognitive content. They conjure up ideas in our minds, and that is cognitive content. The ideas may not represent real things, but that does not take away the ideas. The words are meaningful. Unless, of course, you define “meaningful” as “referring to things in the real world, and not to anything imaginary”. Though I can’t see why you should. And wouldn’t that make it a bit difficult to speak of mathematical entities, and especially imaginary numbers? 1. Taking your argument at face value: According to you, the meaning of those words are the contents of your mind. The content of my mind says those words have no meaning because they have no referent to anything but the content of your mind. Why should your mind dictate the meaning while mine can’t? What we have then is an resolvable conflict with no way out but “yes it is” and “no it isn’t” and “yes it is” and ‘no it isn’t” in endless recursion. Why, because there is no objective referent for the content of your or my mind and thus no way to communicate anything. Rather like a parrot talking to itself in a mirror and as without cognitive content. I don’t know about you but I am not a parrot mouthing meaningless sounds. 2. You confuse fantasy, mental pictures, and that little man saying words to you for cognitive content. If that were the case, your dreams and night mares are also parts of cognition. Not all things that go on in your mind are acts of cognition. 3. The science of mathematics has the reality of counting as its foundation: One rock, two rocks, three rocks. The ability to measure also comes from counting as in counting the number of reference standards that fit into the thing to be measured. Ditto for the highest reaches of mathematics. There is an unbroken chain of logic that connect the highest concept to the basic “one rock, two rocks …”. Unless and until you have traversed the full chain from the lowest to the highest and back again, you don’t know mathematics any better than a parrot who announces “two plus two equals screech screech”. 4. What you are forgetting is the possibility of higher level concepts based upon carefully and thoughtfully organized hierarchical abstractions from lower level concepts to the highest. The process of forming that hierarchy is cognition. The wild creation of descriptions of fantastical imaginary creatures with impossible and contradictory powers is about as far as you can get from actual cognition and still be alive. 5. I agree you can’t see why I should see “to mean” is to refer directly or indirectly thorough a careful chain of logic to things that actually exist. But I do mean exactly that. In other words, to think means to think about something. That something to be something must exist or be logically derivable and reducible to that which exists. Otherwise, you are not thinking. You are simply making noises inside your head that are as inaccessible to others as they are devoid of actual meaning beyond your own foggy miasma of internal intent. 1. Your first argument simply points out that we disagree about the meaning of “meaning”, and that you cannot see a way of resolving the disagreement. On your principles, I am inclined to agree that we cannot resolve it, since there does not seem to be an objective referent for the word “meaning”, and so both your and my discussion of meanings are just “parts of a totally subjective word salad with no validatible and verifiable content.” We are both mouthing meaningless sounds, or, rather, writing meaningless marks. Perhaps you can find a way to escape this difficulty. On my principles, I would point out that the conventional use of the word “meaning” is to refer to the ideas that words evoke, and I see no good reason for not following that convention. 2. If you want to restrict “cognitive content” to mental content which is cognition of the real world, go ahead. That restriction does not automatically imply that only words with cognitive content are meaningful in my concept of meaningful. Why should I accept your concept? What advantage would there be to it? 4. I haven’t forgotten the possibility of higher level concepts based upon carefully and thoughtfully organized hierarchical abstractions from lower level concepts. (This is an extension of your original claim that may well provide you with an escape from the difficulty I referred to above.) But the words for those concepts are still words which refer to ideas. How is our thinking impaired by not restricting “meaningful” to words which refer to only one type of idea? We can still condemn talk of vampires, honest politicians, Marxist conspiracies, and so forth, as being talk of non-existent entities. How about some existent entities such as Ted Kaczynski? Anyone that can fool the damn FBI for that long, must be my hero! This Earth’s equator, with radius 4000 miles and angular velocity 15°/hr, yields an eastward tangential velocity of 1000MPH, surface roughness dragging boundary layer atmosphere with it.The atmosphere is not attached to the Earth and is free to move in any direction. Geometry will show that that 1000MPH atmosphere is resolved into orthoganal components 15°/hr angular and 35MPH radially outward. Neither can be measured! There is little or no angular difference in velocity between surface and atmospheric boundary layer. The 35MPH radially outward does not physically exist. What does exist in its place ,and is measurable, is a 34Pa decrease in surface pressure at the equator, that cannot be explained without further measurement, and much more conceptual thinking, that can try, but is unlikely to fully explain this physical! I hope this sparks some interest in how this Earth’s atmosphere may possibly work! I have no problem with the existence of concepts and ideas. They are vital to the way I work and produce values for myself and others. However, for the concepts or ideas to have meaning within reality and not strictly fantasy, they must be founded on THINGS that actually do exist outside of the mind doing the fantasizing. Otherwise, the abstractions making up the concepts and ideas are floating freely and disconnected from reality. I hold such floating abstractions to be without cognitive content EVEN when I hold them as floating abstractions. Unless and until such things are connected to external reality by an unbroken chain of logic and evidence , they will remain as floating abstractions without an objective referent (ie meaningless). It is a high price to pay but it is the price we humans must pay to stay alive and thrive. When such an approach is abandoned, one is living by luck, charity, or theft either directly or indirectly from governmental handouts. In the long run, that kind of policy will always fail. I totally disagree! Your philosophy is but jerking off in the cloakroom! Concentrated effort of trying, failing, trying again, somewhat different, is called learning, Learning cannot be taught, it must be done by self. When your children are poking at bugs with sticks, the caution ‘bug bite you’ is an attempt at teaching. It is the ‘Wah!, bug bit me’! that is the learning! The resultant ‘Oh poor sweet baby’(hug), may or may not be a learning tool! In due respect Lionell, this is a hangup of yours. I don’t doubt that you have been successful without dealing with this hangup but I have to ask what might you accomplish if you didn’t assume “meaningless” when floating abstractions abound? I also don’t expect you will accept my analyses either but it is offered freely and worth every penny. There’s some films I could recommend if you want hard, hot, ‘n’ wet. I’m afraid you’ll have to do your own research. “I’m afraid you’ll have to do your own research. Reed’s question was to establish the veracity of your use of adverb ‘could’!! Very Latest News flash Breaking: “Scientists” discover the difference between wet and dry, soft and hard, and hot and cold. Scientists working on ‘hot and cold’ have found the exact temperature that indicates the transition from hot to cold or from cold to hot with certainty and incredible accuracy..
Those same scientists have also discovered that the average temperature of boiling water depends upon the temperature of the water when it was first put on the heat. Ha Ha good one James. ….. and the altitude the kettle was at when coming to the “boil”. Too many variable for a reasonable margin of error? Perhaps 97% confidence? No, Pete, kettle is at sea level – gotta have some point of reference. But I have found that as the minimum temperature increases so to does the average temperature of boiling water, but try as I might the actual boiling point never seems to increase – WTF. Do you suppose that fudging daily minimum temperatures in the same way would actually increase daily average temperatures without the daily maximum temperatures increasing at all… ? Could that be why NASA shows 1964 as the same minimum as 1885? Ah! James, my fault for not making it clear. I live in Blackheath at 3500ft. Water boils at about 95C and soft boiled eggs take 6 minutes, not 5! Thus my sarcastic comment re too many variables. Is that a 97% consensus? Is that another example of the all pervasive climate alarmist science’s “Cook’s Constant”? and it will only get worse with climate change (not everywhere but more extreme in some places). I am not a scientist nor am I an engineer. BUT! Is it possible that all this stuff about pollution is just a bunch of garbage because we as humans do not understand enough about the planet yet? We should all be dead by now from what we were told in the 1960′s, yet here we are doing better. Fossil fuels come from the earth, why would they be bad? All this CO2 BS the greenies keep spewing. shouldn’t we have died before the year 2000? Population keeps rising, people live longer, poverty is declining. Maybe we need to understand more about the planet? Abiotic oil is supposedly BS, yet there are some people with technical knowledge that are starting to question that. Does the earth actually produce oil as part of a natural process? Does anybody really know? We have been running out of oil for ever. In the October 1977 issue of Fortune magazine we were told that within 30 years we would have a shortfall of oil. Well 2007 was 30 years on and what do we have now? The more I read up on this stuff, the more skeptical I become. The green movement is BS! No. Were doomed. It’s over. Abiotic oil is not BS. It is the best explanation. The “fossil fuel” story is for little children to enjoy as they giggle at the concept of dinosaurs becoming oil. [I have no idea what put this in moderation since I can find nothing wrong with it. Do be prepared for your implied premise to be controversial though. For those wishing to further explore the biogenic/abiogenic petroleum discussion, this makes useful reading. So where is the example of a known abiotic sourced deposit of hydrocarbons? Um, Titan perhaps, don’t really see a biotic source of the dominant liquid (Methane) there? This would suggest an abiotic origin would it not? So you have visited to sample it? Oh pullease!!!! Why don’t you bring yourself up to speed with modern oil geochemistry. Try googling petroleum biomarkers for instance. while it is clear some hydrocarbon deposits do have a fossil origin, it cannot be claimed with certainty all do. There are planets and moons in our solar system with seas of hydrocarbon, clearly of abiotic origin. As to bio-markers in oil, contamination is plausible for some deposits. Indeed the depth at which anaerobic organisms are now being found in mine water has raised serious questions as the origin of said bio-markers. However even if some hydrocarbons are naturally produced by nuclear sub-surface processes, we don’t have any idea of the rate of production. This is why we must still be conservative regarding their use. For instance, hydrocarbon powered aviation should be restricted to only green “elites” travelling first class between taxpayer funded virtue signalling blather-fests. Come on Konrad,name the hydrocarbon deposits that are not dominantly biotic. Don’t think anyone denies the presence of minor amounts of abiotic methane but beyond that. Why oh why can we not admit that “no one knows”? Go to the Greek God festival, jump the bones of any good looking Goddess!, then claim immunity? If true, pretty cool, eh? But no evidence they are. The Klimatariat has known for decades that Antarctica wasn’t warming but, being the cowardly bunch that they are, nobody raised the issue until their mortgages were all paid off. So if this effect works now it worked in the past and the Antarctic resisted warming in previous warm periods too. So the MWP which was supposed to be a northern hemishpere effect was just doing the same thing the warming is now. There is clear scientific evidence that the Medieval Warm Period (MWP) and Little Ice Age (LIA) both impacted the Antarctic Peninsula. That shows there could still be hope for Climate Scientists, or for one person at least. It displays a desire to learn from, and maybe challenge, the imperfect models. Not just use them to crank out another paper that merely reconfirms the standard preconceptions that were used to construct the models. The difference between the two approaches, IMO, used to lie somewhere between a good undergrad and a late-course PhD student. In much of Cli-Sci the undergrad seems to be the Professor these days. Through currents to mix with the old. Doubtingdave, I think the bigger problem is actually that the nature of the current social-media thing is changing politics. Some good, and plenty of bad, will likely come out of it in the long term. In the short term, social media like Twitter owes its success to rousing the opinions or emotions of many people in a very short space of time. Thus a politician in front of the MSM, who are dutifully following Twitter, suddenly has to deal with what used to be called “a mob”. Stock exchanges around the world are familiar with this phenomenum and the people who set out to deliberately engineer them. Sometimes such events may occur ‘randomly’, as in the original “go viral”, but stock exchanges have software designed to prevent or short-circuit such things. Twitter has made rabble-rousing part of their business model. They are now currently between a rock and a hard place. Their business model is based on encouraging quick, short responses which lead to miscommunication, anger and abuse. Some measures of their traffic volume are now actually falling, maybe as a direct result. They should call twitter….. Fwitter…an accurate description of this idiot sphere. imbeciles…the CAGW true b’lver gang in particular ! And only the Twitterati think its news. What to they mean by “old water”? Isn’t most of the water on earth roughly the same age, billions of years old? “Old” water would be water has NOT been participating in the formal “water cycle” we all learned in primary school. While something of a mis-nomer in-and-of-itself, it is the water which participates last in the eternal oceanic overturning. The ‘old’ water around Antarctica takes longer to circulate into the typical ocean currents than the usual 600 – 800 years of normal ocean circulation. Yes, you are correct, the vast majority of the water on Earth has been here for a long time. Some “new” water is created when you speed down the highway in your family Yugo, or keep your winter home warm with methane (or other gaseous hydrocarbon fuels). Not all of the water on Earth is involved in the water cycle, though. As an undergrad, I was present for some testing at a proposed geothermal electrical generation power station. At the risk of sending this to moderation, I’ll state for the record that the consensus of professional scientists who were leading the project claimed that the water being used to drive turbines (connected to electrical generators) was “juvenile” water. The meaning of ‘juvenile’ in this context means that the water coming from within the Earth had not been in the water cycle for at least several tens of millions of years, or could even have been from within the mantle itself, and had never really been in the water cycle before. The claim was that the signature of the isotopes within the water itself led to the conclusion that it was indeed ‘juvenile’, and not ground water seeping into the well bores. Recall that some entrained water is subducted into the mantle along with sediments, etc, at oceanic trenches. Since it takes several millions of years to cycle those materials back to the surface through volcanism, what comes from deep within the Earth is typically called ‘juvenile’, just by virtue of the residence time outside of the water cycle. If that is unclear, I’ll see if I can help to reduce any confusion. A battered diamond that survived a trip from “hell” confirms a long-held theory: Earth’s mantle holds an ocean’s worth of water. “It’s actually the confirmation that there is a very, very large amount of water that’s trapped in a really distinct layer in the deep Earth,” said Graham Pearson, lead study author and a geochemist at the University of Alberta in Canada. The worthless-looking diamond encloses a tiny piece of an olivine mineral called ringwoodite, and it’s the first time the mineral has been found on Earth’s surface in anything other than meteorites or laboratories. Ringwoodite only forms under extreme pressure, such as the crushing load about 320 miles (515 kilometers) deep in the mantle. Most of Earth’s volume is mantle, the hot rock layer between the crust and the core. Too deep to drill, the mantle’s composition is a mystery leavened by two clues: meteorites, and hunks of rock heaved up by volcanoes. First, scientists think the composition of the Earth’s mantle is similar to that of meteorites called chondrites, which are chiefly made of olivine. Second, lava belched by volcanoes sometimes taps the mantle, bringing up chunks of odd minerals that hint at the intense heat and pressure olivine endures in the bowels of the Earth. Seismic waves suddenly speed up or slow down at certain depths in the mantle. Researchers think these speed zones arise from olivine’s changing configurations. For example, 323 to 410 miles (520 to 660 km) deep, between two sharp speed breaks, olivine is thought to become ringwoodite. But until now, no one had direct evidence that olivine was actually ringwoodite at this depth. “Most people never expected to see such a sample. Samples from the transition zone and lower mantle are exceedingly rare and are only found in a few, unusual diamonds,” Hans Keppler, a geochemist at the University of Bayreuth in Germany, wrote in a commentary also published in Nature today. The diamond from Brazil confirms that the models are correct: Olivine is ringwoodite at this depth, a layer called the mantle transition zone. And it resolves a long-running debate about water in the mantle transition zone. The ringwoodite is 1.5 percent water, present not as a liquid but as hydroxide ions (oxygen and hydrogen atoms bound together). The results suggest there could be a vast store of water in the mantle transition zone, which stretches from 254 to 410 miles (410 to 660 km) deep. Plate tectonics recycles Earth’s crust by pushing and pulling slabs of oceanic crust into subduction zones, where it sinks into the mantle. This crust, soaked by the ocean, ferries water into the mantle. Many of these slabs end up stuck in the mantle transition zone. Keppler noted that it’s possible the volcanic eruption that brought the deep diamond to Earth’s surface may have sampled an unusually water-rich part of the mantle, and that not all of the transition-zone layer may be as wet as indicated by the ringwoodite. The tiny, green crystal, scarred from its 325-mile (525 km) trip to the surface, was bought from diamond miners in Juína, Brazil. The mine’s ultradeep diamonds are misshapen and beaten up by their long journey. “They literally look like they’ve been to hell and back,” Pearson said. The diamonds are usually discarded because they carry no commercial value, he said, but for geoscientists, the gems provide a rare peek into Earth’s innards. Interesting indeed. This might be the answer to a bible mystery. broken up, and the windows of heaven were opened. 7:12And the rain was upon the earth forty days and forty nights. Wonderful summary, ROM. Thank you for that. Hope the idea of ‘old’ and ‘new’ water is now better understood by the participants of this thread. Did they forget that cold water is denser and sinks? Sure displacement by the wind can upwell some old cold water, but the wind isn’t always present, isn’t always strong enough to cause this upwelling and the S pole is a powerful source of new cold water to replace anything that upwelled to the surface. It will not take mere centuries to exhaust the cold (old or new) water, but will take until the Sun reaches its red giant phase and consumes the Earth. This is a classic case of acknowledging only the small slice of reality that can be spun to support a cause while ignoring anything else. This is how politics works and this is how Nature reports. It’s not that I disagree with any of this but I’m puzzled — what is “old water”? How does water get old? I think that the bulk of water on Earth has to be the same age. Do they mean water that hasn’t been near the surface for a long time as I think? Or is it something else. Or is that your term, Jo? In any case it’s a confusing choice of terminology. Ocean currents I can understand, however. And I’ve wondered for years why the climate change camp has kept insisting that Arctic and Antarctic floating ice is melting from increasing air temperature above it when warmer water below it seems like such a better candidate to investigate. The specific heat values of air and water just don’t compare with each other, thus the ability of slightly warmer water to melt significant amounts of ice is so much greater than the ability of slightly warmer air. I assume air at atmospheric pressure. As for the premise Nature has put forth, IT’S ABOUT TIME! From the description I assume “old water” is sea water that has been sea water for a very long time, as opposed the sea water that was recently river water, ice or water vapor. Also, or alternatively, “old water” could be sea water that has stayed in the same region at similar temperatures for a long period. You could be right. Do I remember correctly that sea water is slightly more dense than fresh and consequently they don’t mix very rapidly? Or does it even matter? Perhaps Old Water is water that has appeared on Antiques Road Show? Jo needs to supply something a little less intoxicating on this blog. I mean, old water is having a very detrimental effect, don’t you think? Old water is a bit like the ancient trees in Lord of the Rings, the Ents. It is stuff from ancient times that comes to save us (at least temporarily) and be the hero. “Which rather begs the question: If there was a conundrum then the skeptics who pointed it out were not deniers, but correct.”BINGO! You know the conundrum was basically all noise and no signal, so they ignored reality and agreed more work needed to be done. and what did you think of the new work? sounds like you agree with what you already knew to be the case and disagree with what you don’t. Lucky you don’t plan scientific experiments. Or a more helpful way of putting this is, how would you interpret their data? Antarctica is getting colder and the ocean circling is also cooling without the aid of upwelling. The Southern Ocean carbon sink has gone into cruise control and the nearby old growth forest is also hard at work. As you know water vapor is by far the greatest greenhouse gas and it puts a damper on temperatures no matter how much CO2 is floating about. Southern Ocean responds to oscillations on the centennial and longer timescales and has nothing to do with carbon dioxide gas forcing. Its also worth remembering that the cooling of the Southern Ocean and the increasing extent of sea ice is all down to a positive Southern Annular Mode (SAM). So all that stuff that was released before the publication that is the subject of the blog post. The data has obviously been tortured to get the desired outcome, you should take climate change more seriously. Let’s not worry about them, the upwelling came to an end late last century. Gee Aye, the Subtropical Ridge should have its centre closer to Dubbo than in the Great Australian Bight. What do you make of this? well it is certainly further south than typical for the winter (which can be further north than Dubbo). The prognostics are predicting a lot of change over the next few days. I don’t think my opinion of the factors causing this using only that map, my eyes and my brain will be very edifying. Why are you asking? Its natural climate change and I thought you might be interested in witnessing the start of a mini ice age. The CMIP5 models show the STR is intensifying and has a clear poleward movement in the Southern Hemisphere winter (Grose et al) and presumably increased ice extent. It pours cold water on AGW. While the publication ‘Nature’ investigated the abundant use of prefossilized coprolite in science, it was found that 97% of the most offensive odoriferous elements were freely venting from the stagnant putrefaction pool of ‘Climate Science™”. In conclusion it is considered this is caused by investigative atrophy. MBPFC = ‘male bovine pre-fossilized coprolite. Maybe a bovine laxative would fix that? You should see what it looks like when a cow shits over yonder in the middle of the night, on a real time 8-13 micron FLIR (forward looking infra-red receiver). Tail goes straight out. Explosive Vesuvius follows then plop on ground, with sparklers emanating upward like that milk drop photograph! We all help others to get up from ROFLMAO! Yep, they’ll get it on their hands and fingers and it will go all over the papers on their desks. What a mess. The goldfish won’t look like goldfish any more. The Paper also debunks a part of GISTEMP. The global data is split into 8 bands by Longitude. The most southerly encompasses Antarctica and mostly. They have temperature data going right back to 1880, but there were no permenant bases on Antarctica to collect temperature data until the 1950s. The most Southerly temperature station before that was Base Orcadas. I found the temperature anomaly for Antarctica until 1950 was extremely erratic, showed cooling in the early twentieth century (when the rest of the world was warming) and was very similar to Base Orcadas. In terms of the Ocean current charts, Base Orcadas is roughly where the warmer surface currents circuling Antartica overlay the cold currents moving from the Atlantic. This explains the variability, and why it cannot be a temperature proxy for anywhere else. The implications of the above is that global average surface temperature anomalies based on land thermometers and random samples from the oceans might be quite wide of the mark. Shifts on ocean currents may be a cause of localized temperature trends that are quite different from other areas. Long term shifts in weather fronts may be another. As a consequence, the attempts to eliminate real biases, such as the UHI effect, may do the opposite. Because in many areas of the world the best temperature records tend to be in towns (where the are people to read them) the most consistent temperature trend across a region could be the UHI effect. I discuss this further here. They’d better toss the whole mess soon. California’s getting tricksy with the laws, and if this one passes BEFORE the mess is tossed, well, the warmistas will be on the end of a stick they were waving at everyone else. All quail before the California Inquisition! Something else to consider is that while the Thermohaline circulation is commonly considered to be driven by density differences, the trigger is the hydrological effect of water pushing up from the bottom at the equator to replace the relative difference between evaporation and precipitation. Net evaporation towards the equator effectively pulls the ocean surface up while net rain towards the poles pushes the surface down, thus deep cold water pushes up at the equator, pushing the thermocline up with it, but never reaching the surface. The slightly cooler surface water resulting from removed latent heat is heated by the Sun reestablishing an equilibrium thermocline insulating deep ocean cold water from warm surface waters. Note that in most of the latitudes where there is net precipitation, there is no effective thermocline, so the net precipitation can be considered to replenish the deep ocean cold while gravity drives the colder denser water down. Yes, density differences matter, but it’s not the whole story. The implication being that as long as there is net evaporation towards the equator, net precipitation towards the poles and that each pole is in darkness for months, there will always be enough cold water to sink and replace that which is pushing the thermocline up. Furthermore, since the thermocline effectively insulates deep ocean cold from warm surface waters and deep ocean cold is clamped at 0C, the only water that reacts to changes in the planets equilibrium temperature is that in the thin slice of warm ocean water above the thermocline plus a thin slice of the thermocline itself and not all of the water in the worlds oceans. This is why the planet responds fast enough for us to recognize seasonal variability and is why the time constants on the order of decades to centuries needed to support CAGW theory can be precluded. As I read it the premise of this study is to suggest the ‘old cold deep water’ in the oceans act as earth’s cold air conditioner that is offsetting our dangerous acceleration of CO2 production. Of course time is running out as there’s only so much ‘old cold deep water’ to go around and once again us greedy selfish humans don’t care while we march towards oblivion. I wonder if these CAGW alarmists know there’s a difference between scepticism and pessimism? Given that +95% of the World’s water is completely unknown, climaganda has a nerve using the term ‘old’ water. As much nerve it seems to segue seamlessly from ‘global warming’ to ‘climate change’ and ‘weirding’ and then to invoke ‘regional warming’, the very thing that falsified the ‘global’ failure of IPCC models. Given the less than 1C warming in the last century (Lloyd 2015), which lies entirely within natural variation, such proclamations remain politics. But politics it has been said, is the art of lying. These climate folk lurch between both badly. You’ll have the wrath of the grant wallowers howling at you from the trough-house. Climate scientist will be spluttering their Penfolds Grange Shiraz 1973 reading about your belief in “natural variation”. Good gawd, “natural variation” is why ‘climate science’ was invented – TO KILL SUCH A NOTION! You seem not to understand that the only variations allowed are those that mankind inflicts on the planet. Regional warming from the AMO, and El Ninos is all there has been in the whole satellite record. Despite the rise of CO2, there has been no warming in the southern SH outside the tropics for 20+ years. 38 years in the Antarctic. ….no warming in the southern hemisphere outside the tropics…. Humanity is now aware that Antarctica cannot melt and flood water world, but does the Southern Ocean carbon sink become invigorated because of a particular mechanism? Ken Stringer has been showing us the pause for the world’s regions for a long time. The only place to show recent warming is NH extra tropics, by about 0.17C per century. Big deal. Here are all the graphs and his comments for all the regions. Sorry above should be Ken Stewart not Stringer. Grrrrrrr. Looks again like a lot of commenters are commenting on someones comments on someone who has not read the paper’s take on the paper. This site looks dodgy and it will send you a pdf without asking but it passes all government and university firewalls so it must be safe! It is good for the soul and the brain to read past the abstract yourself. Perhaps the paper has some teeth to it, but it’s not obvious in the press release. Time to analyse the science as well as analyse the spin? This 2015 study found that an increase in Co2 emissions actually cools Antarctica. But I suppose you all heard about this study through our MSM? Funny I missed it too. I think that you are on to something Neville. Have a look at the Earth emmission spectra on p15 of this paper. The emmission spectra were recorded by the Nimbus 4 satellite over the Sahara, the Med and Amtarctica. Over the Sahara and the Med there is a dip in the spectrum at e CO2 wavelength implying that CO2 is absorbing surface radiation. Over the Antactic however there is increased radiation at the CO2 wavelength indicating that CO2 is and emmission pipe in those cold temperatures. I’ve been thinking about this stuff for a bit but my knowledge of radiation physics is not up to the task. CO2 absorbs at specific wavelengths and some of the energy goes to vibrational energy (temperature). What happens to the rest? My limited understanding tells me that there will be considerable reemission of photons at different energy levels. Can someone out there enlighten me as to whether this is the case and, if so, at what frequencies does this occur? Are these frequencies characteristic to the molecule? This diagram by Robert Rhode is quite good and is widely reproduced. It shows the absorbtion spectra of water vapour, CO2, methane and some other gases. As I understand it a CO2 molecule may absorb an infrared photon and vibrates. It can then either re-emit a photon or pass the energy to other air molecules by collision. Also the reverse can occur. CO2 vibrates after a collision and emits a photon. I have some reservations about Robert Rhode’s diagram, including the fact that what he shows as the Earth emission spectrum does not match actual observations very well. it can then either re-emit a photon or pass the energy to other air molecules by collision. Also the reverse can occur. CO2 vibrates after a collision and emits a photon. Not exactly. The kinetic energy of a typical gas molecule in motion is less than the nominal energy of a LWIR photon involved in GHG absorption/emission, so the possibility of a collision energizing a GHG molecule is nearly zero. Collisions between GHG molecules and O2/N2 may result in the GHG molecule emitting a photon and a small amount of energy may be taken from or given to the linear kinetic motion of the GHG molecule as it emits or absorbs a frequency slightly away from resonance. This is the mechanism behind collisional broadening which has an equal probability of speeding up the molecule as it does of slowing it down. The primary way that GHG effects can heat O2/N2 is indirectly by being absorbed by liquid or solid water in the atmosphere which then collides with O2/N2 gas molecules. 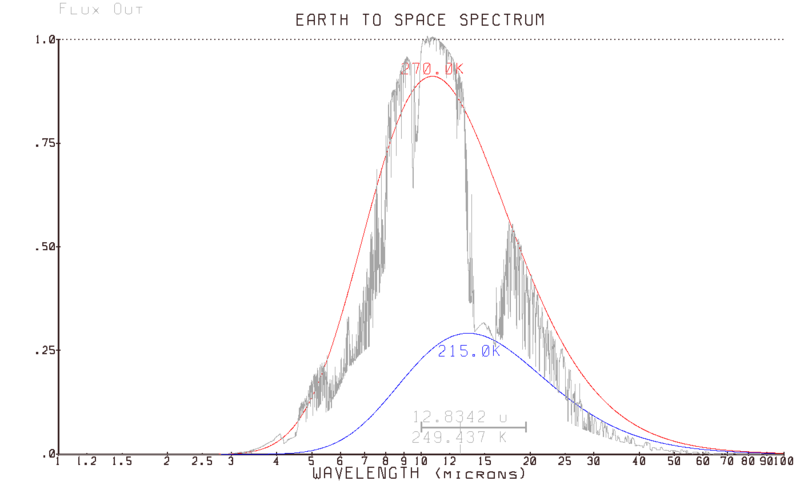 And yes, the spectrum is not what we observe from space as we see significant energy in the absorption bands. The spectrum shown is what passes through the transparent parts of the spectrum and does not account for those re-emission from GHG molecules which eventually leave the top of the atmosphere (about half of the energy that does not pass through the transparent window). You make a good point which I had not considered i.e. that Robert Rohde only shows the atmospheric window in his diagram. The real spectrum includes the GHG emissions. That explains the discrepancy quite nicely. What nonsense! You are confusing the fake rms molecular energy with the 2mv change in momentum within the interval of collision/repulsion. The 0.066 ev required for thermal 15 micron emission from that highly resonant molecule is easy to obtain, and the work function for such emission is way less than that. The chart shows nothing of an emission spectrum! That chart is a lopsided cartoon of the measurable gas attenuation of the modulation that may be present on electromagnetic radiative flux! There is no way to distinguish unmodulated (DC) flux through a gas and such flux from that gas! The kinetic temperature of a gas is determined by the mass and speed of colliding gas molecules in motion. All of the photon energy absorbed by a GHG molecule is converted into rotational or vibrational energy which for the most part is stored as a resonance in the periodic variability in the shape of the molecules electron cloud. While the nucleus does move around a bit, being thousands of times heavier, the motion is thousands of times smaller. Equipartition of Energy is often misinterpreted to consider the vibrational/rotational motion of a molecules electron cloud as a degree of freedom of mechanical motion that is shared with all others, but this is distinctly different from physically translating, vibrating or rotating the entire mass of a molecule. For one thing, modes of storing energy in electron shells are constrained by the laws of quantum mechanics and only relatively large, specific quanta of energy can be added or removed at once, while the physical motion of a molecules mass is not necessarily quantized, except perhaps at the Planck scale. Another way to express this is that storing energy in electron clouds is a narrow band process, while storing energy as matter in motion is a broadband process. Of course, if you put a thermometer in it, the temperature will reflect this stored energy since energy is stored only temporarily and is quickly emitted as another photon which is absorbed by another molecule resulting in a flux of absorption band photons and photons affect temperature sensors in much the same way as collisions with air molecules do. After all, joules are joules. Not exactly. The kinetic energy of a typical gas molecule in motion is less than the nominal energy of a LWIR photon involved in GHG absorption/emission, so the possibility of a collision energizing a GHG molecule is nearly zero. I just thought I might do a quick check on that. Calc Tool gives the energy of an IR photon of 15micron wavelength (CO2) as 8kJ/mole = 1.3×10^-20J/molecule. Average kinetic energy/molecule of diatomic gas=5/2KbT. Say N2 at room temperature; 5/2×1.38×10^-23×288=1×10^-20J/molecule which is approximately the same. I might have made a mistake, but if not I would say that a collision between an N2 molecule and a CO2 molecule could give the CO2 enough energy to emit an IR photon at 15 micron wavelength. If CO2 does not derive energy from molecular collisions and then emit a photon, how then do we explain the emission spectra derived from the Nimbus 4 satellite over Antarctica which I noted in 36.1 and again here. Scroll to page 15. Your T is too high for the average atmosphere. My calculation was based on mv^2/2 which worked out to be a little less. In any event, the kinetic energy of a collision must be much greater than the energy of a state transition in order for any significant possibility that a collision will cause a state transition. If its the same, the molecule stops moving and its effective temperature becomes 0K which is very UNLIKELY. If less, the effective temperature would need to drop below 0K which is impossible. A few points to make about these plots. First is that using a linear wave number scale makes the effects from CO2 and H2O seem more more important then they really are, relative to the energy in those bands. A more appropriate scale would be a log scale of wavelength in which case the 15u band shrinks to be proportional to the actual energy in that band. Another point is that as cold as it is in Antarctica, water vapor is nearly absent and at 210K, we are even below the melting point of CO2. Here’s a more representative plot based on energy density and is the calculated composite result (average clouds + clear) from my version of Hitran for the mid latitudes. Regarding the Antarctic data, it’s not clear whether this is looking at surface ice or clouds and what season was the measurement made. Based on the temperature, I suspect its during winter when clouds are warmer than the surface. In any event, the total energy leaving the polar regions is a tiny fraction of the energy leaving the planet. What makes you think that some ‘state transition’ is a requirement for thermal EMR flux origination? You certainly have a weird idea of what temperature is!! As long as a molecule is a gas it retains all of the heat of evaporation of that matter! OK then, let me fumble through this. photon energy absorbed by a GHG molecule is converted into rotational or vibrational energy which for the most part is stored as a resonance in the periodic variability in the shape of the molecules electron cloud. Which is not a quantum process? Which is a different process from the excitation of rotation / vibration? How does the energy of this photon compare to that of the incident photon? Or, to put it another way, how does the spectrum of the emitted photons relate to the absorption spectrum? Its been a lot of years since I was on even a nodding acquaintance with quantum mechanics. If I could refer you to the reference I found once (about 15 – 20 years ago … ) I would send you there. It was a ‘handout’ for an on-line Physics class from a major university; it may still exist, but time constraints limit the amount I can devote to finding old references. What I saw was more than enough “proof” that CAGW was a total scam, especially when you combine what this class handout showed, vs. Al Gore and his “Inconvenient Truth” cartoon of a 15-micron photon going “up” into the atmosphere, and being ‘reflected’ back to the ground. 6) The energy gained by the absorption of a 15-micron photon may be dissipated by emission of several lower-energy photons, say in the radio range. So this idea that when a CO2 molecule “absorbs” a thermal IR photon, that the same photon comes back to Earth to cause heating is ludicrous, to say the least. There is a 1-in-6 chance of that happening to begin with, and then, an emitted 15-micron photon has 4-pi-steradians of angle to depart its “host” ! It’s about a 50/50 whether said photon ever makes it back to Earth in the first place! Also realize that the above discussion involves processes which take place in times measured typically in nanoseconds, or less. We can treat the above discussion as an isolated event, taking place as it were over a time span of several minutes, but the reality is that it happens continuously, and instantaneously also. Hope that helps. It would be great if some of the artisans and Brainiacs here and at Anthony’s could come up with a video that shows the above processes. Maybe it could be incorporated into a “Skeptics Handbook, e-version, II” or something like that. The modes of storing energy in an electron shell are different resonant modes of the electron. Schroedinger’s wave equation predicts and describes both the quantization of energy stored in electron shells and the non quantization of motion. In most cases, an energized GHG molecule will emit one or more photons whose total energy is the same as was absorbed. This gets complicated when collisions are involved and less energy can be emitted as photons as the molecule speeds up or more energy can be emitted as photons as the molecule slows down. It’s important to recognize that the amount of energy converted is a small fraction of the total energy involved and that there is an equal probability that the molecule will speed up or slow down, thus there is no NET transfer of energy from photons to translational motion. The physics in the absorption and emission of light by molecules is far more complicated than comment bites here. Standard treatise on atomic spectra, by Condon and Shortley, fills 432 pages of text. Herzberg’s treatises fill 581 pages for diatomic molecules, 538 pages for polyatomic molecules, and 670 pages for the electronic spectra of polyatomic molecules. Bohren and Clauthiaux on Atm. Radiation: 470 pages, Townes and Schawlow devote 648 pages to microwave spectroscopy. And the physical strain of just lifting these nearly 3500 pages is as nothing compared to the mental strain of absorbing them. The interesting link posted by Neville 10:43am Fig.s 2,4 and explanation is a decent & much shorter summary worth reading/absorbing in this field. Rotational energies also are quantized similar to electronic energies. Carbon dioxide has a bending mode with frequency 667.4 cm−1 (15 μm) and an asymmetric stretching mode with frequency 2349.2 cm−1 (4.25 μm). The asymmetric stretching mode is infrared inactive. It is CO2 vibration-rotational band near 15 μm that is the infrared active major player in the global surface warming & upper atm. cooling scenario associated with increased carbon dioxide well mixed in Earth atmosphere. At normal terrestrial atm. trop. temperatures, the air molecule average energy (Boltzmann constant*T) is appreciably less than the separation between electronic energy levels (~100*Boltzmann*T) but not separation of rotational energy levels (~1/3*Boltzmann*T) . For those reasons, can ignore electrons in determining the energies of gas molecules for troposphere meteorological purposes. Electron levels move the specific heat of STP air negligible amount as borne out by testing. I just laid out some specific ref.s to compare each item of your unnamed reference “found once (about 15 – 20 years ago … )”. You will do better science basing your comments on actual observations abounding in those named ref.s. For example, none support your contention “The photon can be re-emitted”, all support the photon is absorbed by CO2, i.e. photon death. Any emitted photon is born anew. A photon transmitted: lives on. Yes, it is more complicated, but simpler explanations are easier to digest, even if not completely accurate, albeit accurate enough. All of the photons energy is EM in origin (i.e. a resonant LC circuit whose impedance is Z0/a, Z0 -> impedance of free space, a -> fine structure constant) and all of this energy is absorbed by the electron shell, whose impedance is the same as a photon (hence the easy conversion back and forth). There is often confusion that kinetic terms like spin, angular momentum, etc. are applied to quantum mechanical state which are really just resonances constrained by the speed of light, the specific geometry (static or time varying) and of course, Schroedinger’s wave equation. While we can think of such concepts in the particle domain for the purpose of conceptualization, we can also quantify them as wave functions where spin, angular momentum etc. have different interpretations relative to the behavior of the wave. The 15u absorption band is strictly vibrational. There are no rotational modes of CO2 that can be excited by a 15u photon. co2isnotevil 8:37am – The simplest explanations work only when they are possible. Your electron shell explanation is not possible for Earth trop. air at STP where the air avg. molecular energy is of the order boltzmann constant*T. There is not enough energy in STP absorption/collisions for electronic energy level increases. To kick up one electronic energy level you are going to need absorb energy order of 100*boltzmann*T as I wrote. As a consequence of conditions normally found in Earth trop., photon energy levels are not sufficient to increase electronic energy from predominant base level to the next highest electronic level. For the next highest rotational, vibrational energy level all you need is 1/3 to 10 * boltzmann constant*T, hence rotational, vibrational quantized levels are the predominate earth air energy absorption methods not electronic as you write. Once again you reduce to a simple explanation that is not possible. In reality, measurements show, CO2 bonds are not constrained to a line: as the triatomic molecule bends at 667.4 cm−1 (15 μm) the concurrent rotation along the line (also quantized) causes a changing dipole moment thus CO2 15 μm band really is measured to be rotational-vibrational. If ALL the internal modes of motion of molecules, including those of their electrons, neutrons, and protons, contributed significantly to the specific heat of gases, the world would be measured a much different place. To energize a ground state CO2 molecule, all that is needed is the energy of a 15u photon or about 1.3E-20 joules. You seem to agree with me that there is not enough translational energy to do this by collision, but you don’t seem to think that the absorption of a 15u photon can. BTW, the translational energy is 2/3*kT, which is about 6E-21 joules at 288K or about 1/2 of the energy of a 15u photon. I have no idea where your 100*kT value came from since 1.3E-20 joules (the energy of a 15u photons) is only about 4/3*kT. There is no dipole moment of a spinning, but not vibrating (ground state), CO2 molecule, thus rotational modes are not IR active. If its vibrating as well, the dipole moment comes from the vibration and is slightly modified by concurrent rotation and what this does is add fine structure to the absorption spectrum. The point I’m making is that the tiny amounts of conversion between rotation and vibration consequential to collisions have an equal probability of increasing or decreasing rotation, thus no net energy from GHG absorption is directly converted into rotational energy. I get that. To kick up one electronic energy level you are going to need absorb energy order of 100*boltzmann*T.
As you confirm, there isn’t enough 15 μm photonic energy to do so hence your “The electron shells of GHG molecules absorb all the energy of an incident photon..” is not correct at STP per measurements. The quantized energy levels of molecule rotation ARE found spaced close enough together (~1/3kT) to absorb the incident 15 μm photon. No argument from me; this was an attempt to help the individual named “Lightning Camel” who asked a question. Of course the quantum Physics of this is much more complicated than my “… unnamed reference … ” (I promise, if I ever find it again, I’ll ask Jo or her mods to put it up for us) would have us believe. Please recall that in everything we know, study, learn, we start with simpler parts, and gradually extend into the multi-thousand page references on Emission/Absorption Spectra. My ‘dissertation’ was not intended to be accurate down to a hairy gnat’s eyelash, just a broad discussion of what I learned (for the first time, mind you) about what a CO2-molecule can do when it reaches an excited state. Prior to learning that, I had the impression that an absorbed photon ONLY resulted in the emission of a fresh photon, of the same energy (obviously, I disputed the concept so graphically illustrated by the subsequent Inconvenient Truth that the photon automatically and unidirectionally headed back towards its source, the Earth. In that cartoon, we see the ‘warmists’ attempting to explain a rather complex process in a simplified manner). Remember, to teach someone something, you have to approach it at their level; approaching a question from a learner at your level is a guarantee of failure. That being said, I would again appeal to those with artistic and scientific abilities to consider creating a video of some sort, which would show each of the possible outcomes, as listed in 36.1.1.2.1. We start with an opening shot of a “sample” of atmosphere, 2499 molecules of N2, O2, Ar, H20, and a single CO2 molecule. We zero in on the CO2 (after some introductory remarks about the general make-up of the atmosphere), then cut to the animations of the CO2 in isolation, and show it absorbing a 4-micron photon (followed by results of that absorption), then a 15-micron photon, and the subsequent results. It might be worthwhile to work into a comparison which shows a single CO2 and the proper proportion of H20-molecules (say, a nominal 50-to-1, give or take), each doing their thing (spectroscopically). With your background, you could advise the production crew, to assist in making it as accurate as possible, within the limitations of what we can reasonably expect to show in a 3-to-5-minute video, presented at the educational level of most adults. The goal here would be to make something which drives another stake through the heart of the CAGW-vampire, unassailable by the likes of Gavin, Al, Kevin, J’mma et al… Once you make it clear to someone that one molecule in 2500 does NOT dictate the temperature of the other 2499, we gain the high ground. I’m a great adherent to a supremely important law in the history of science: “the Infinite Chain of Priority: Somebody Else Always Did It First”* so the video very likely already exists. Consider that the 1 molecule has 1,000x the avg. translational KE of the 2499. When molecules collide, translational KE can be transformed into rotational and vibrational energy and vice versa. This expectation is borne out countless times every day on pool tables all over the world. Also, as expected in the top post, when cooler water upwells into warmer water. *Tony Rothman, 2003: “Everything’s Relative and Other Fables from Science and Technology”, John Wiley & Sons, p. xiii. Unlike the ‘pool table’, the atmosphere is 3-D, so collisional energy does something else: it brings about convection, which is a thermal stabilization (and ultimately, release) mechanism. Whatever else CO2 does, it also causes the atmosphere to seek an equilibrium condition (which it never reaches), which then brings about other effects. Are you implying that the effect of increased CO2 is linear? We add more CO2 to the atmosphere, so there is more ‘heating’ effect on the atmosphere? Just in case that is your position, then you are not up to speed on the diminishing effect of more CO2. Geological evidence proves that the effect diminishes with increased concentration; had it not, we would have gone thermal runaway back in the Cryogenian, if not before. Convection is not from micro collisions, convection is macro, thermally driven mass motion in fluids, brought about when a fluid is warmed from below in a gravity field. If the fluid is not warmed from below, there are still micro collisions but no macro convection. The thermally driven fluid motion in the top post is in part from convection and in part from different temperature & density gradients. No, given long term Earth ~steady state, the SW&LW IR photon numbers are reasonably fixed in&out; thus an increase in IR active gas such as CO2 means fewer and fewer unmarried photons available to date. The effect is logarithmic decreasing. CO2 cannot “heat” the total atm. as it burns no fuel like the sun. Added IR active CO2 extinction coefficient increases the clear atm. optical depth thus as I wrote “global surface warming & upper atm. cooling” over/under ambient without the added CO2. As I wrote the interesting link posted by Neville 10:43am Fig.s 2,4 and explanation is a decent & much shorter summary than a text, worth reading/absorbing in this field. Supposedly, CO2isnotevil, Lieutenant Cusper, you, Jo, and I should be playing on the same team (he indicates the logarithmic decay of CO2′s “warming” effect), but takes issue with trivia. Instead of taking issue where there (really) is none, it would be nice if Lieutenant Cusper would devote the same energy to finding the video he thinks already exists (I’ve not found it in many years of looking), or lending his expertise into creating such a video gratis, or otherwise taking the fight to the enemy. Yes, we all seem to be worrying about the finer points of CO2 theoretical effects when in reality CO2′s effects are measured as negligible/lost in the noise. Zhao, L., Xu, J., Powell, A.M., Jiang, Z. and Wang, D. 2016. Use of SSU/MSU Satellite Observations to Validate Upper Atmospheric Temperature Trends in CMIP5 Simulations. Remote Sensing 8: 10.3390/rs8010013. In a test of climate-model-based projections, Zhao et al. (2016) conducted an inter-comparison of temperature trends extending from the middle troposphere to the upper stratosphere as derived from real-world satellite observations made by Stratospheric Sounding Units (SSUs), Microwave Sounding Units (MSUs) and the Advanced Microwave Sounding Unit-A (AMSU) as well as CMIP5 climate model simulations. And what did this comparison reveal? Well blow me down. I thank you all for your work to answer my queries. First off, I know that this is very complex and I appreciate some of you are probably frustrated trying to simplify for those without the required background. What I take from this is that when a molecule CO2 absorbs a photon there are various ways the energy may be apportioned. Occasionally a photon of similar wavelength may be emitted but it is much more likely that there will be no photon or a photon of different wavelength. Lots of things follow from this but, if my basis is correct I thank you. Vlad, you do good things here but the origin of your name absolutely brings tears to my eyes. The most likely result is the emission of a photon. The reason is quantization where all of the photon energy absorbed by a GHG molecule must be released all at once or not at all and of course, the probability of stimulated emission by an energized GHG molecule upon capturing another photon is near 100%. The most likely scenario is that an energized GHG molecule collides with N2/O2 and re-emits a photon very near to the energy of the photon that energized the GHG molecule in the first place. Any slight difference may end up as physical motion of the molecule, but its equally likely that the emitted photon will be have a little more energy in which case it steals a tiny bit kinetic energy from the molecules motion. Note the distinction between a molecule moving (kinetic temperature) and a molecule vibrating (EM temperature). One manifests temperature by collisions and the other manifests temperature by photons. The difference as it relates to the planets radiant balance and surface temperature is important to understand and whose importance is often lost by improper conflation. The crucial things to understand is that at most, only a very tiny part of the captured energy is not emitted as a photon and because the photon can be a little more or a little less energetic then the photon that energized the molecule, the net conversion of photon energy to the kinetic temperature of molecules in motion is zero. Note as well that while rotation is quantized, the quantum of energy is very low and in the microwave band which leads to the fine structure in the emission/absorption spectrum of CO2. The nature of this fine structure alone is the evidence that most of the energy captured is emitted as another photon. Only when re-emitted photons are absorbed by atmospheric water can any significant amount this energy be transferred to the translational motion (i.e. kinetic temperature) of N2/O2. But then again, the kinetic temperature of atmospheric O2/N2, whether heated by GHG’s or any other means, is irrelevant to the radiant balance, the sensitivity and anything else about the planets climate since O2/N2 does not radiate energy in any relevant energy band, either back to the surface or out into space. It’s kinetic temperature is simply slaved to the surface temperature and the lapse rate arising from gravity. Nov 2015: LiveScience: Elizabeth Newbern: Antarctica Is Gaining Ice, So Why Is the Earth Still Warming? this story must be rattling the CAGW mob. Reuters’ Doyle piece is dated 30 May so, even with time difference, it’s well over a day old. Australian has had its piece online for 22 hours. yet, at this stage, there is no coverage from NYT, WaPo, BBC, ABC, Fairfax, Guardian or, indeed, from most of the rest of the MSM!!! I have been reading a book about Antarctic exploration. One thought I had was that there seemed to have been more Antactica sea ice in Cook’s time 1770-1790 since he made several attempts to find land in the Antrctic region but was unable to penetrate beyond 65S due to a wall of ice. Captain James Clark Ross managed to penetrate a peripheral wall of ice in 1841 and then was able to sail way further south than anyone had done before reaching about 75S and finding the edge of the Ross ice shelf and the coast of Victoria land. Since then ships seem to find open water as far as Commonwealth bay at least in mid summer. In recent years Antartctic sea ice extent has been increasing which would imply that the Antarctic region had been warming since the Little Ice Age but is now getting colder whereas Arctic sea ice extent has continued to decrease hence warming. It is perhaps moot as to whether sea ice extent is a good proxy for temperature but it seems to me that it might be quite a good one. So now its old water versus new water ? Sounds like old BS versus new BS! Wasn’t the hot water hiding in the deep ocean , suspiciously where no one can find it , much less measure it ? The Climate Kookoos are redlining the BSometer . So, the paper in question “explains” why the warming was not uniform. However, the same logic that is used to bolster the global warming hypothesis is used to discredit the MWP. The new study may feed recent suggestions by other researchers that the Medieval Warm Period was in part just an extended phase of the North Atlantic Oscillation (NAO). Warmist, the just gotta have their cake and eat it, too? Look, I hope no-one is going to use this latest study to suggest that we aren’t doomed. That would be going too far. Does that mean “they” will not need any CO2 trading now ?…just kidding..we need it to save the penguins or bankers..or something..or is it all doom ahead with..”its nearly not as worse as we thought..but it worse ever..” or some other meme for the morose..
You have covered all the pertinent points and highlighted the related flaws in the green argument. They do seem to have shot themselves in the foot with this one. no wonder WaPo is not keen to report this study! about the writers: Motta has worked in the energy and environment field as a program manager at the National Renewable Energy Laboratory. White is professor of geological sciences, professor in the environmental studies program, and fellow and director of the Institute of Arctic and Alpine Research at the University of Colorado in Boulder. Nerem is a professor of aerospace engineering Sciences at the University of Colorado in Boulder, and leader of NASA’s sea level change team. After crowing about the strong wind generation for South Australia last month, I can’t see RenewEconomy putting up any mention of today’s lacklustre figures. And the Aneroid site show that the capacity factor has been below 25% since 3pm yesterday, below 20% since midnight, below 10% since 7am and below 5% since 9am. Now I know South Australia has been losing industry and installing lots of solar panels but seriously – this is beyond a joke. The interconnector and gas plant figures will make very interesting reading tomorrow. If Hazelwood closes it won’t just be bad for SA. Vic will also be in trouble. What distresses me so much is that they call our brown coal,”dirty coal”. No it is not. It is beneficial coal. Based on propaganda that claims CO2 is a pollutant. So lignite, being very wet, requires more of its’ mass to be burnt to supply a set amount of energy compare with black coal, so emmitting more CO2/mJ. Ash content (ie. mineral content) also affects this. But Ian both ash value and elements such as sulfer levels are low in these Latrobe lignites. The good thing about Hazelwood being such an old plant is that the boiler/generator units are quite small by today’s standards at 200MW each. This means any shutdown will be staged and the grid will show stress before the whole plant is shut down, bringing the whole shutdown process to a screeching halt. I’m guessing that once half the units are offline, there will be a calm, hot day or early evening where all the possible demand has been shed (looking at you, South Australia) and all other baseload generation and the imports from the Snowy maxed out and peakers strained and then brown outs will occur at the fringes of the grid. Combined with the panic calls from South Australia (while they can still make them), the Victorian government will be forced to face reality and the old faithful will be brought back up to full capacity and planning for its successor will begin. All supposing South Australia’s grid hasn’t collapsed on its own prior, bringing Australia as a whole to its senses. Analitik -the French owners are considering shuttering the whole lot according to industry sources yesterday. If they do it would be fun to see what happens if it just happens with short or no notice. The average temperature for the past three months was 1.86 degrees above average, beating the previous warmest autumn in 2005. Autumn’s hottest day was 47 degrees Celsius at Mardie in Western Australia on March 3. The coldest day was -2.5C at Thredbo in New South Wales on May 27. About half the country experienced its warmest autumn ever, with records set in Queensland, New South Wales, Victoria and the Northern Territory. Popcorn big time; Off Topic!! The Chiefio; E.M. Smith who made an appearance here a few posts back was quick off the mark with this one as his post is dated 1st June and the mid west is about 14 hours behind us here in Oz. If this report ion Clinton is genuine and we will wait and see about that, it could go a long way to explaining why Sanders is still running in the Democratic pre selection despite his being way behind Clinton in delegates. Back to our program dear readers! As we are discussing the deep abyssal ocean currents some quotable paras from a Stanford course lecture [ probably from around the late 90's] might make a lot of folks here think. As the warmists with their very limited imaginations have trouble thinking about anything beyond their models and their fixations on CO2 being in total control of the global temperatures, they will be excused if they have trouble comprehending the following paras and just what they might mean for mankind when, not “if”, these drastic climate shifting phenomena once again appear as they have done regularly down through paleo history. Page 12; The ocean conveyor Belt. The present form of the conveyor belt appears to have been initiated by closure of the Panamanian seaway between the North and South American continents ~ 4.6 million years ago. At this time the Gulf Stream intensified resulting in the transport of warm water to high latitudes. As a result NADW [ North Atlantic Deep Water ] formation intensified and increased atmospheric moisture input to high latitudes, helping to trigger the growth of northern hemispheric ice-sheets. There is strong evidence that the conveyor belt has switched regularly from one mode of operation to another in the past. The associated changes in climate have been large, abrupt and global. The changes seem to be driven by factors controlling the density of high-latitude North Atlantic surface water. These events appear to have been triggered by an increase in iceberg input, mainly from Canada. These icebergs transport terrigenous debris across the North Atlantic. When they melt they deposit a layer of ice rafted material on the sea floor. These periodic events in the geological record are called Heinrich events. The input of fresh water reduces production of NADW thus slowing or shutting down the present mode of the conveyor belt. The record of these events has been perfectly preserved in the sediments from as far away as the Santa Barbara Basin and the glaciers in the Columbian Andes. At the time of these events the climate cools at high latitudes and globally. The climate records in Greenland ice reveal that over the past 60 kyr conditions switched back and forth between intense cold and moderate cold on a time scale of a few thousand years. These so-called Dansgaard-Oeschger cycles are characterized by abrupt changes in temperature,dust content, ice accumulation rate and methane concentration in the atmosphere. The onset of these cold events occurred on time scales as short as a few decades to a few years (Alley et al., 1993). Each period of intense cold has been matched by an ice rafting or Heinrich event in North Atlantic sediments. As a result of the switch to a colder climate, iceberg production slows and the salinity of the North Atlantic surface water slowly increases, enabling NADW formation to occur again. The return to the “warm phase” occurs much more slowly, over a thousand year time frame. Climate alarmist science is beginning to look like the “Ouja Bird”. Going round and round faster and faster in ever decreasing circles until it flies up its own ****** and disappears forever! The Atlantic meridional overturning circulation (AMOC) has weakened substantially over the past decade. Some weakening may already have occurred over the past century, and global climate models project further weakening in response to anthropogenic climate change. Such a weakening could have significant impacts on the surface climate. However, ocean model simulations based on historical conditions [ aka "observations"! ] have often found an increase in overturning up to the mid-1990s, followed by a decrease. It is therefore not clear whether the observed weakening over the past decade is part of decadal variability or a persistent weakening. Here we examine a state-of-the-art global-ocean reanalysis product, GloSea5, which covers the years 1989 to 2015 and closely matches observations of the AMOC at 26.5° N, capturing the interannual variability and decadal trend with unprecedented accuracy. The reanalysis data place the ten years of observations—April 2004 to February 2014—into a longer-term context and suggest that the observed decrease in the overturning circulation is consistent with a recovery following a previous increase. We find that density anomalies that propagate southwards from the Labrador Sea are the most likely cause of these variations. We conclude that decadal [ edit; ie; natural ] variability probably played a key role in the decline of the AMOC observed over the past decade. Extreme weather is increasing toxins in our food – which can be fatal. As temperatures keep rising, it seems the problem will only get worse. DW interviews a chief scientist at UNEP. Extreme weather is increasing the levels of toxins in our food, according to a new report by the United Nations Environment Programme (UNEP). With global temperatures set to rise by more 3 degrees Celsius, scientists warn the problem will only get worse. DW spoke with UNEP chief scientist Jacqueline McGlade out of Nairobi. Deutsche Welle: What were the main findings of the report? Global new investment in renewable power and fuels (excluding large hydropower) rose to $285.9 billion last year from $273 billion in 2014, the report said. “The renewables train is barrelling down the tracks, but it’s running on 20th century infrastructure – a system based on outdated thinking where conventional baseload is generated by fossil fuels and nuclear power,” said Arthouros Zervos, chair of REN21. For governments to achieve their emissions cut targets under a global deal to tackle climate change called the Paris Agreement they need to integrate more renewables into the grid; design policies to financially discourage fossil fuel investment and remove risks from investing in renewables, the report added. No Doubt, it’s a pattern alright. Norm Page nominated the great climate shift happened around 2003, exactly the same time as the southern ocean carbon sink picked up a notch. This should be good news but the warmists say increased acidification is the other side of the coin. Anyway the ABC did reveal this gem. ‘CSIRO and Antarctic Climate and Ecosystems CRC scientist Bronte Tilbrook, who collaborated with scientists from America and Europe on the research, said the sink had increased again by about 0.6 billion tonnes of carbon per year — about six times Australia’s emissions. “What it’s shown is while the sink did weaken in the 1990s, it looks like it’s coming back since about 2002,” he said. Save me reading the paper …..
WRT where the dyes were used, does Nature mention the size of the tank, the shape of its base or how ocean volumes were simulated? Was it in a very big building? Were heat lamps used to simulate the Sun? What did they use for floating ice? How did they produce the “old water”? A useful bit of information. Thanks GI. Pretty much the same thing, and to be frank if Nature is walking back the Cult’s core theology, it might be time to have a party, because nek minnit it will be taken as self-evident that there’s a pause that might last generations. “The ocean currents are, in a way, the most majestic of its phenomena. Since the world began, the ocean currents have undoubtedly changed their courses many times (we know that the Gulf Stream is no more than sixty million years old), and it is impossible to describe their pattern in the Cambrian period, for example, or in the Devonian, or in the Jurassic. During the brief period of human history, however, it is most unlikely that there has been any important change in the major patterns of oceanic circulation. This is not surprising, for the forces that produce the currents have shown little disposition to change materially over the eons of earthly time. The primary driving power is supplied by the winds; the modifying influences are the sun, the rotation of the earth ever toward the east, and the obstructing masses of the continents. As the surface of the sea is heated by the sun, the water expands and becomes lighter. Probably a slow exchange of polar and equatorial waters is brought about this phenomenon; the heated water of the tropics moves poleward in the upper layers, and the colder and heavier polar water sinks and creeps toward the equator along the floor of the sea. But these movements are obscured and largely lost in the far greater sweep of the wind-driven currents. The steadiest winds are the trades, blowing diagonally toward the equator from the northeast and the southeast. It is the trades that drive the equatorial currents around the globe, the direction of their main streams being always westward.